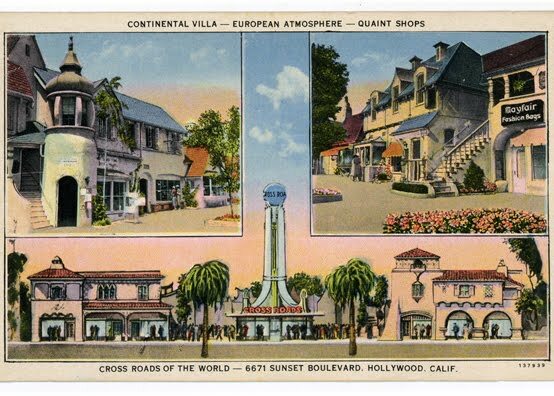 One of the most fascinating, and certainly one of my favorite, buildings in Los Angeles is the "Crossroads of the World," located on Sunset Blvd. in Hollywood. Anyone remember the 1970's band "America" and their Greatest Hits album? As a teenager, it was the back of the album that caught my eye. 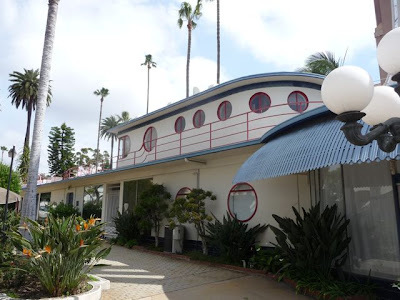 There beneath the Hollywood Sign, two members of the band stood next to an amazing art-deco style building surrounded by open fields and palm trees. 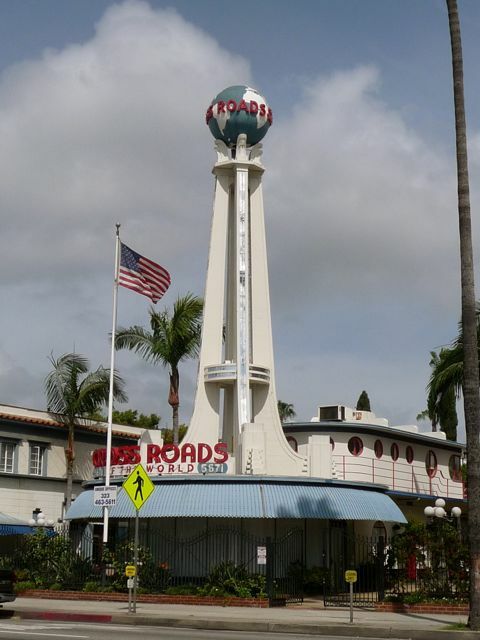 Growing up in Los Angeles, I remember driving down Sunset Blvd with my parents a year or so later. And then I saw it. "THERE IT IS!" I screamed (which I'm sure my parents appreciated). 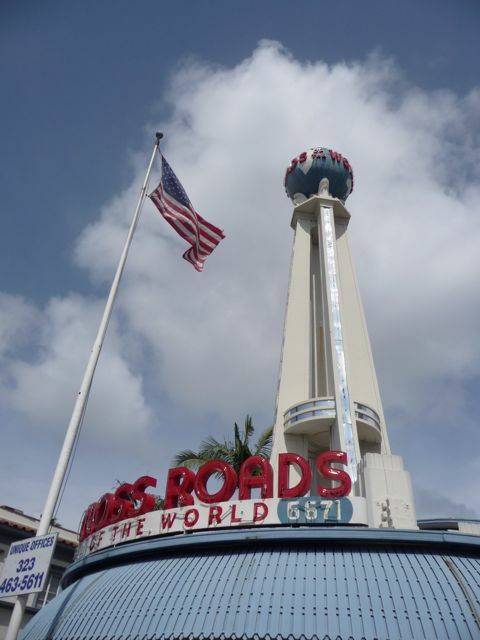 "THE CROSSROADS OF THE WORLD!" 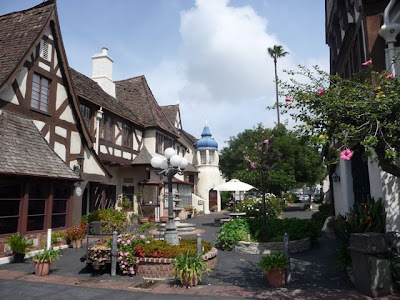 My wife and I were in Los Angeles last week (see my previous blog post). We stopped by Crossroads on our way out of town. 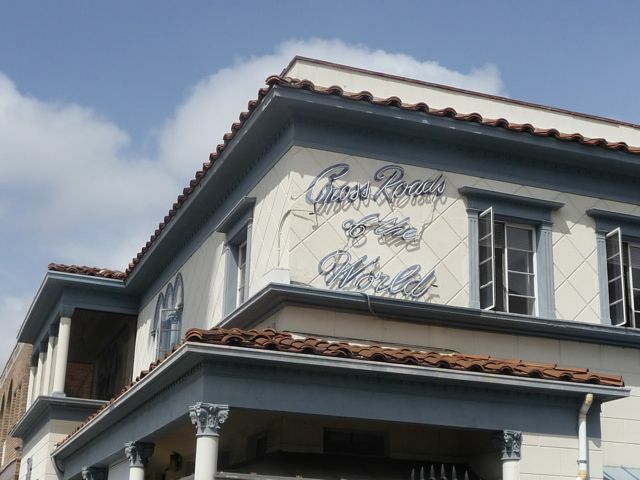 Crossroads of the World is located at 6671 Sunset Blvd, two blocks south of Hollywood Blvd, in Hollywood. 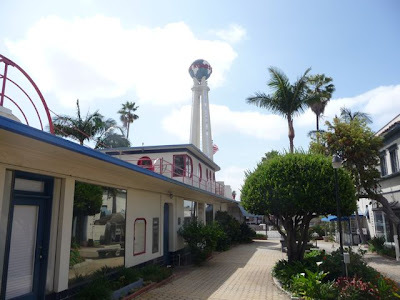 Opened in 1936, it is described as America's first outdoor shopping mall. 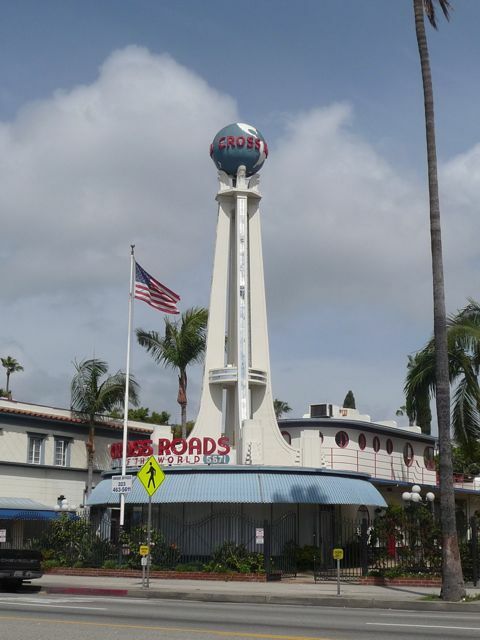 Today, Crossroads consists of offices, mostly tied to the entertainment industry. 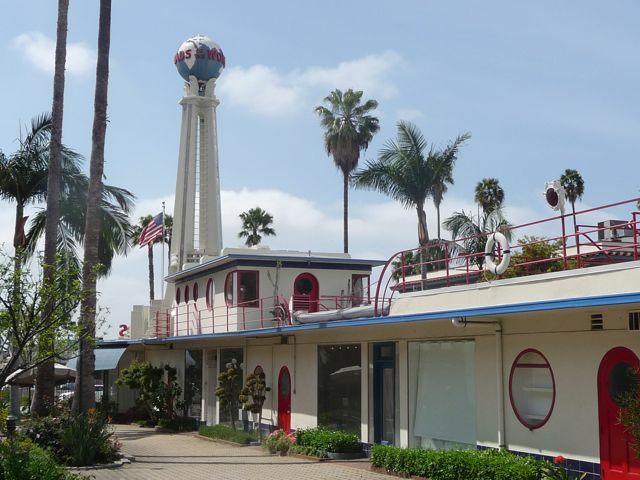 When it first opened in 1936 retail shops filled the first floor. According to their website, shops at Crossroads of the World originally included hair stylists, a French parfumerie, an Oriental arts and gift shop, a Spanish cigar maker, a high-fashion ladies dress shop and even a "handkerchief specialist," catering to celebrities (including W.C. Fields and F. Scott Fitzgerald) and upscale shoppers. Here's a classic old photograph I found on "google images." The center of Crossroads is a ship-like building, appropriately known as the flagship building. 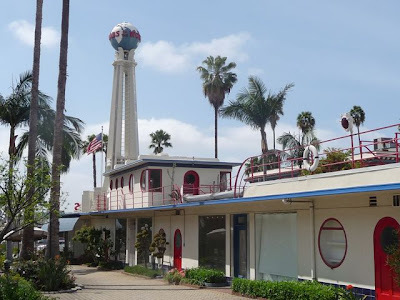 It was designed by architect Robert Derrah, who also designed the similarly styled "streamline modern" Coca Cola building a few miles away in downtown Los Angeles. 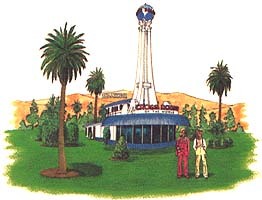 It was the flagship building with it's distinctive 60 foot tower and globe that was featured on the back of the America's Greatest Hits album I first saw. This is the west side of the building, looking south towards Sunset Blvd. Here's another vintage postcard. What made Crossroads of the World so interesting then, and today, is the variety of architectural styles surrounding the ship building, hence the concept: "crossroads of the world." 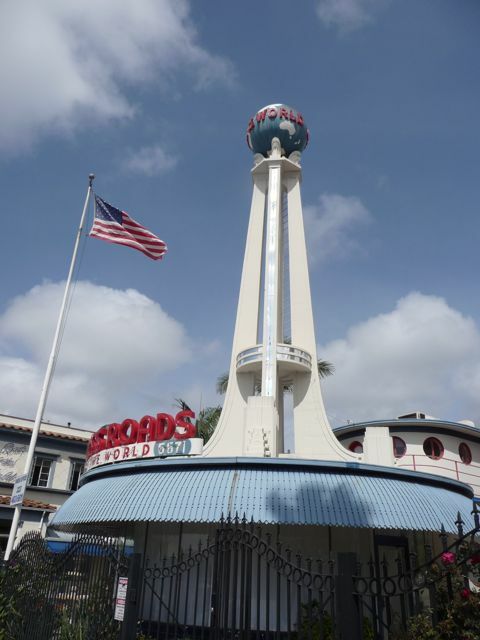 Long before Epcot Center in Florida tried to transport visitors to various countries around the world, Crossroads boasted a series of buildings featuring Spanish, French, Moorish, Italian, and English architectural styles. There are some amazing architectural details. Apparently, each door is custom designed. 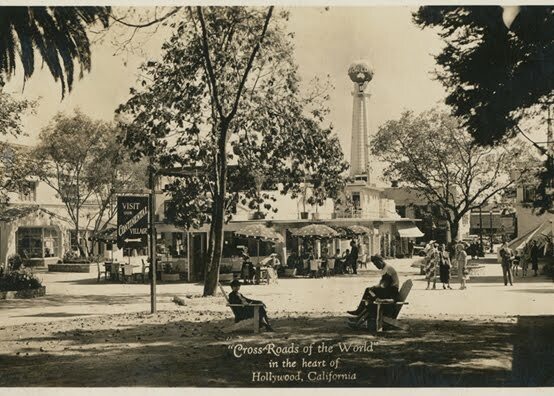 Like much of Hollywood, Crossroads of the World fell on hard times in the 1960's and '70's, and was close to being demolished and replaced by an office building. 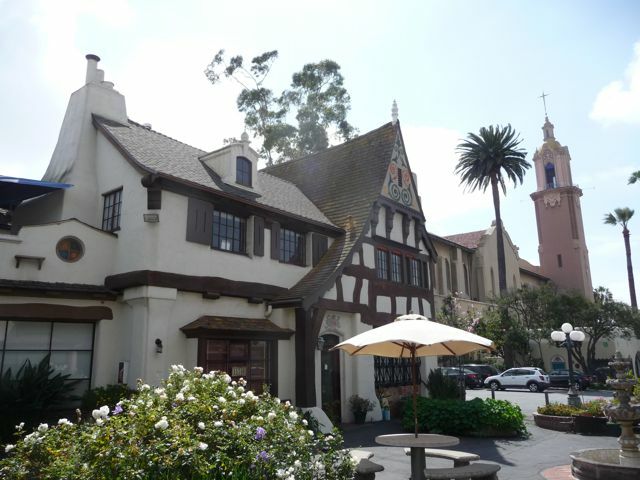 Developer Morton La Kretz purchased the site in 1977. Over the next several years Kretz worked to restore it to it's original grandure. 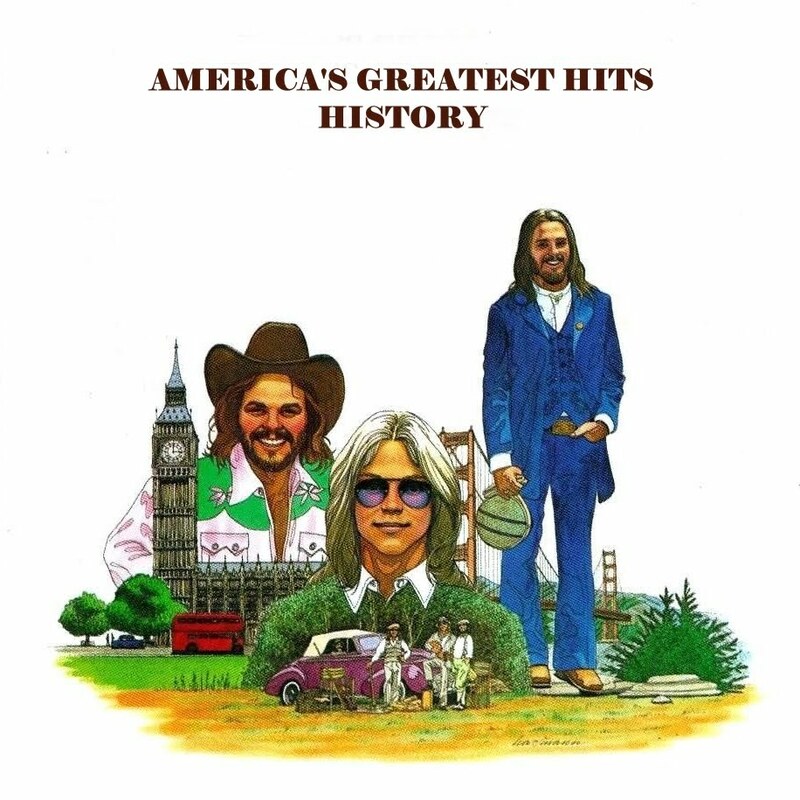 It's funny, but I wonder if the artwork on the back of the America's 1975 Greatest Hits album had any influence on Cross Roads being saved from demolition two years later. The neon sign on Selma Avenue. 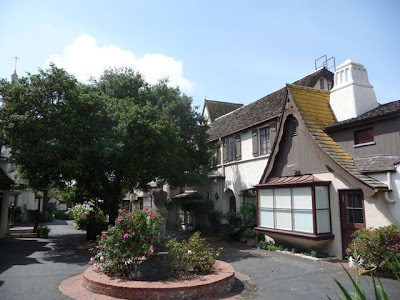 Apparently, the oak tree in the courtyard is over 100 years old. Love the landscaping. Very different than the feel and vibe of Hollywood Blvd, just a couple of blocks away. Another view, looking towards Sunset Blvd. The tower is part of the large Roman Catholic Church immediately adjacent. As this is an office complex, it was very quiet. I wonder if the owners have ever considered converting any of the ground floor offices back to retail. This courtyard would make an ideal place for outdoor dining. How about a coffeehouse? 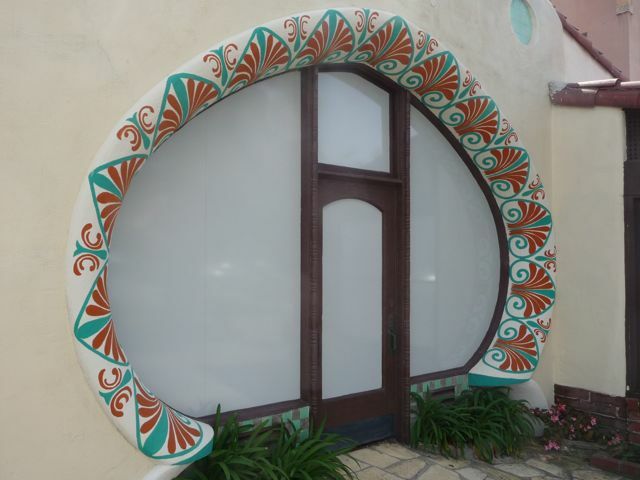 Detail on the Moroccan style building. Another view of the flagship building, this time from the east side. 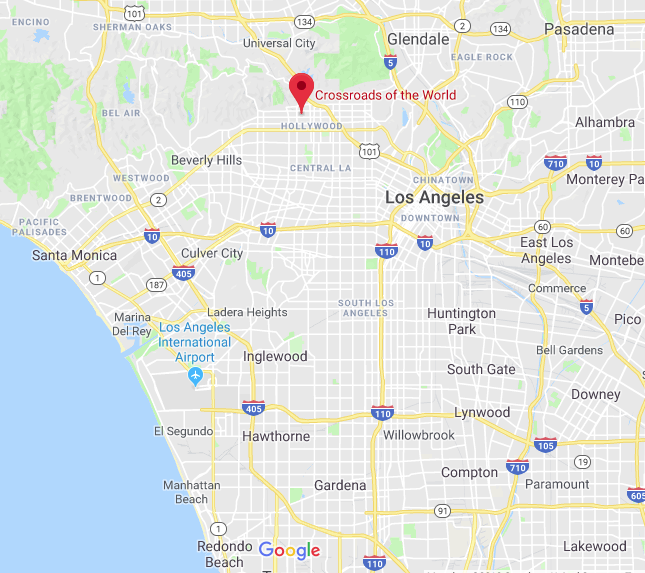 Unlike Grauman's Chinese Theater, the Walk of Fame, or the massive Hollywood & Highland retail complex (all just a few blocks away), there's not a lot to do at Crossroads of the World. But maybe that's OK. 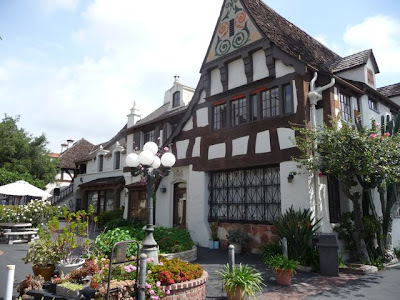 It's a step into Hollywood's past, an amazing architectural treasure, and yet another thing that make Los Angeles in general, and Hollywood specifically, unlike any other place in the world. 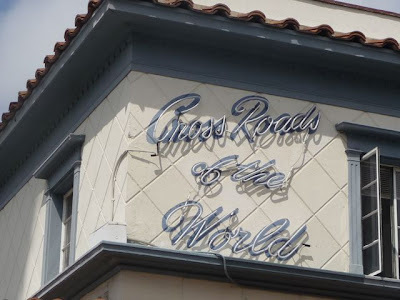 In perhaps the ultimate compliment, a scaled down replica of the Crossroads of the World flagship building stands at the entrance to Disney Studio Theme Park in Walt Disney World, Florida. This was taken back in 1996 when I was living in Orlando for a couple of years. 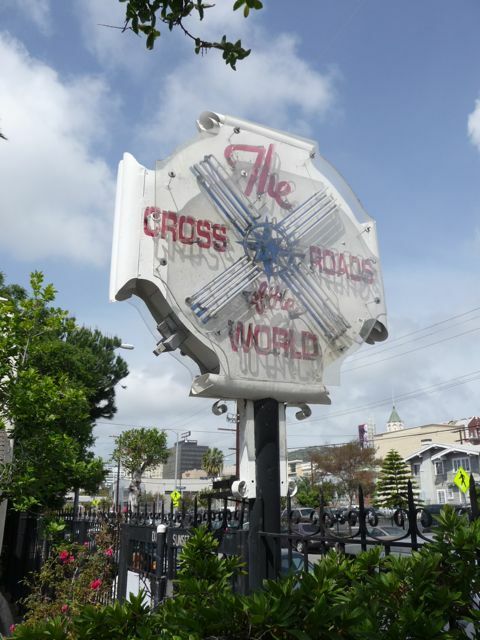 Here's a link to the Crossroads of the World website. Love your blog Dave! Happy Birthday too!! 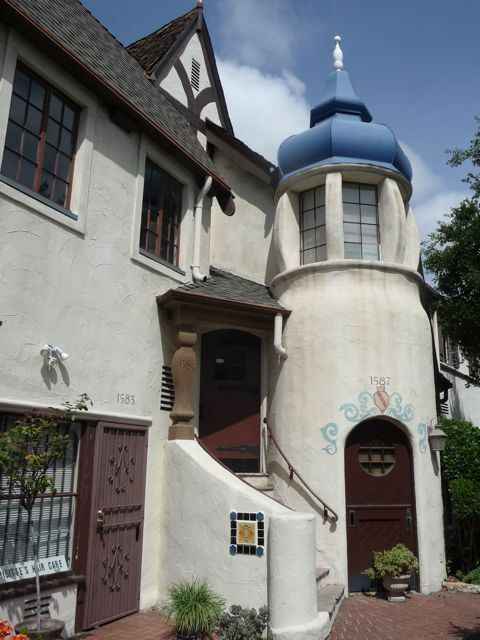 I grew up in Silverlake in the 1970's and one of our tenants in my parents apartment building had an office there. I always thought it was a neat building. I have always loved this place. The cover art for America's Greatest Hits History was created by Phil Hartmann, later known as "The Glue" of Saturday Night Live and for his role as Bill McNeal on NewsRadio. His name is allegedly on the front, I don't know if he did the back...but from what I can tell, it looks like the same artist.